GRAND OPENING: Stony Brook University’s Island Soul Caribbean concept is the result of collaboration with several student groups. The Caribbean plate is the result of many cultures converging to create warm, inviting flavors that make lunchtime an oasis. The Island Soul Caribbean concept at Stony Brook University in New York features hearty menu items like mango jerk salad, curried goat, barbecue or pineapple jerk chicken, jerk ribs, hot wings and oxtail. A rotating menu of veggie sides includes plantains, yams, rice and peas, mashed yucca and more. Staples from the American South—collard greens, catfish and Cajun dishes—make appearances on the menu as well. The concept, which kicked off last year with a grand opening festival and cook-off, has been an ongoing collaboration between campus dining, the Caribbean Student Organization, the Student African American Brotherhood, the Stony Brook University Office of Multicultural Affairs and the Phi Delta Psi Fraternity. At the beginning of this year, Island Soul moved from the Union Commons location to the Emporium at East Side Dining, the newest dining location on campus. At that time, to boost the authenticity of the menu options, Island Soul partnered with local food truck owners Kaydon Davis and Tesfa Latty of the Jamaican Café truck. “The key to Jamaican Café working with Island Soul is that we create authentic food that brings comfort to people,” Davis says. Students are craving the comforting island food, with sales increasing by 30 percent in the first two months at the new location and projections of continued growth and more flavorful menu items to come. Purdue University’s dining and catering team partnered with the United Soybean Board to create Caribbean fried bananas, which are spiced up with cinnamon, wrapped up in tortillas then fried in soybean oil (which is trans-fat free and made with Indiana-grown soybeans). The dessert is crowned with a dollop of white chocolate mousse and a drizzle caramel crème sauce. Find the recipe online at food-management.com/recipes. At Restaurant Associates’ EXPLORE Station, a rotating international concept at several accounts, island time has proven to be one of the most popular and profitable. “The Jamaican Jerk [left] concept has done exceptionally well at the EXPLORE Station and is one of our best-sellers when compared to a yearly round up of all other Explore Station concepts,” says Josh MacGregor, general manager with Restaurant Associates, adding that the cooked-to-order Caribbean concept yields a margin of 67 percent. Guests choose a protein—roasted chicken or pork, seared shrimp or grill tofu—all of which are rubbed with Jerk seasoning and then paired with two sides and one salad, turning lunch into a midday oasis. Sides include curried rice and beans, sautéed callaloo (a leafy green dish with roots in West Africa) and caramelized plantains. Salads include mango or creamy coleslaw. 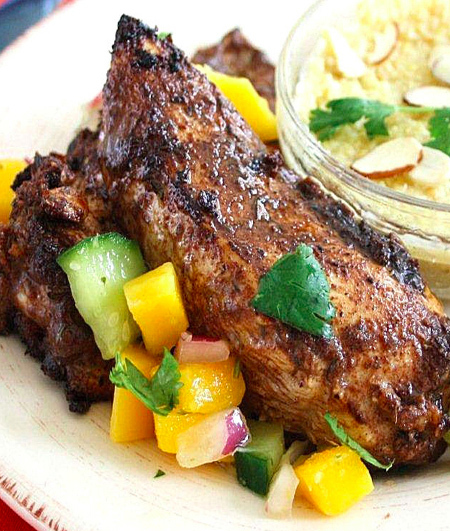 Jerk is a dry rub, a marinade and a style of cooking native to Jamaica. Meat is rubbed or marinated with the spice mixture—most often, you’ll find allspice, cloves, cinnamon, nutmeg, thyme, brown sugar, ginger and salt—then grilled until charred and succulent. Caribbean jerk seasoning always also includes Scotch bonnet peppers, an addition that came when the original seasoning recipe arrived with slaves from Africa who escaped the British in Jamaica in the 1600s. Now, the seasoning can be found all over the globe, adding rich flavor with a touch of heat, as seen above on chicken thighs at Penn State.